Greg SEMU is an autodidact ‘stills’ photographer, independent researcher, visual artist and philanthropist working in the field of community arts and social justice. 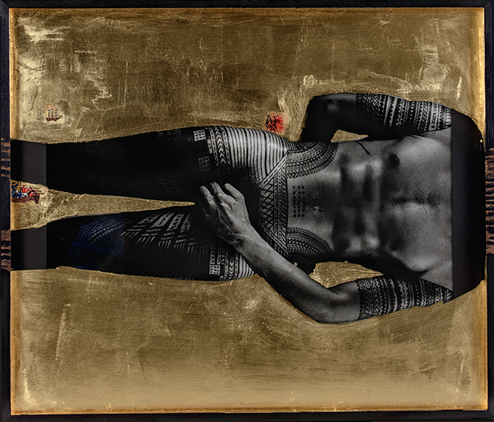 "Semu's work grapples with Western art history and leads us towards a Maori understanding of the events surrounding their ancestors' migratory voyage to New Zealand"
Navigating the complex quagmire of colonial history retrospectively and progressively in the contemporary. A long painful centuries old saga deliberately obscured and permeated with hidden crimes of atrocities, war and unsuccessful multiple genocides, committed against humanity on a global scale in the name of freedom, religion and education, a few names for ‘greed’ masquerading under the disguise of improvement. Displacement, isolation, confiscation and bereavement is the colonial experience! Profound intergenerational loss, suffering and demoralisation is the reward of the aftermath for first nations people. Portraiture is the foundation of his art practice, augmented and scaled up to engage displaced and marginalised communities ethnic or aboriginal with arts focused projects negotiating the horrific legacy suffered upon their ancestors and in the present. Using the visual medium of photography as the vehicle to aggressively questioning the force fed archival narratives, deaths in custody, injustice and incarceration law and enforcement as factually inspired reconstructions. Revisiting and reexamining the evidence and residue of historical events and reconfiguring and presenting alternative case files and conclusions for re-digestion. Fabricated realities designed to provoke dialogue and shift paradigms at both end of the spectrum. Empower the downtrodden disempowered and illicit empathy and compassion from the wealthy overpowered policy and decision makers of government and industry to take action and correct this gross legacy. The seduction of suffering, the human condition and trials and tribulations are stories secreted in the visual universe of Greg SEMU.